Thanksgiving weekend flew by so fast. It’s hard to believe that the long awaited break is over and I have to get back to work. As much as I love the idea of Thanksgiving, it is still a novelty for me. My first Thanksgiving experience took place in 2011 when my buddy Nathan invited me over to his parents’ house knowing that I was alone. I had just moved to the US at the time and barely knew anyone, so it felt really good to have someone think about me. Later I found out that Nathan’s father had the same experience when he was a freshman in college and didn’t know anyone so he made a promise to continue the tradition of inviting someone who’s far from family. It was a great experience: obviously we overate, drank good wines and watched football, which I didn’t understand because I (still) don’t know the rules. It felt like a genuine way of saying thanks to your family and friends for being there for you all the time. It’s really nice to have a day when you acknowledge all the things and people that you’re thankful for, but in reality you should do that every day. It’s so easy to get caught up in your daily life and forget about what makes life so great. Too often this fast-paced lifestyle that we are part of doesn’t allow us the luxury to think about all the great things that happen to us. We spend too little time celebrating and enjoying our achievements. We just tend to move on to the next thing on our extensive list of things we want to check off. It’s as if we are continuously chasing something and way too often we forget to enjoy the journey. It may be a cultural thing. I feel like here in the U.S. people live in the future, always looking forward, always thinking about what’s going to happen next and forgetting about enjoying the present. I’m not saying it is something bad. It’s just different from what I’ve been used to. For example, in Eastern Europe the mentality is the complete opposite- people live in their past. They love nostalgia and talking about how great things were years ago and they more often than not complain about the present. Give it a shot next time you meet an Eastern European and you’ll see that about 2 minutes into the conversation the person is going to be talking about our history and how great things were in the past. There is something comforting in recalling memories and talking about the past and no one does it better than Eastern Europeans. Now that I’m away, every time I go home and talk to my parents, family or friends I realize how conversations revolve around our past. Especially when elderly people meet, the first topic they’ll talk about is their health. Conversations start with the standard "How have you been?" which quickly spirals into a shitstorm of problems and struggles. People love talking about their problems, so be careful when asking an older Eastern European this question unless you’re ready to hear that person’s medical history. You’ll learn about everything they’ve dealt with in the past few years with a very detailed description of the back pain they have when the seasons change. You’d think that you just joined a never ending pity party when all of a sudden you hear them end with “But I can’t complain”. That’s when it’s your turn to start whining how bad your health has been. My granny, Buna, and her friends are the most entertaining. As a matter of fact, she sometimes just waits around the window or front porch of her house for a friend to pass by so she can start talking about her most recent health issue. The conversation almost instantly turns into a game of one-upping each other. If my granny had a flu, most likely her friend had something twice as bad, which in turn will bring up another health issue my granny had years ago that trumps her friend’s one. It is an interesting experience for an outsider. The funny part is that after about half an hour of complaining they both agree that life is actually great: there is still food on the table, a roof over their head, a cozy warm bed during the cold winters and of course the Mexican novelas. Now, back to the present, where we should all strive to live. This meatballs recipe (chiftele in Romanian) is my family’s go-to emergency food. Whenever my mom runs short on time or is out of ideas, she makes meatballs. They are easy to prepare, filling, and of course delicious. Romanian meatballs are slightly different than Italian or Spanish meatballs as they are made out of pork with milk-soaked bread, a generous amount of garlic and parsley, and deep fried to a crispy exterior and juicy interior. My mom prepares them not only as appetizers, but also as a main dish. The only difference between the appetizer and main dish meatballs is the size - smaller for appetizers, larger for main dish. Back home in Transylvania they are served with a side of mashed potatoes and tomato sauce, or with creamy squash and dill stew. The latter is my dad’s favorite, a Hungarian staple dish, called tökfőzelék. If none of these sound appealing to you, feel free to eat them with bread, homemade marinara sauce and shaved parmesan just like we did. Poftă bună! Place potatoes in a medium sauce pan and cover with water. Add half tablespoon of salt and bring it to a boil over high heat. Reduce the heat to medium and cook the potatoes for 15-20 minutes or until they are easily pierced with the tip of a knife. Remove from the heat, discard the water and let them cool down. While the potatoes are boiling, soak the bread in milk in a bowl until all the milk is absorbed. Using a knife or your hands peel the potatoes (the peel should slip off easily) and pass them through the small hole of a cheese grater. 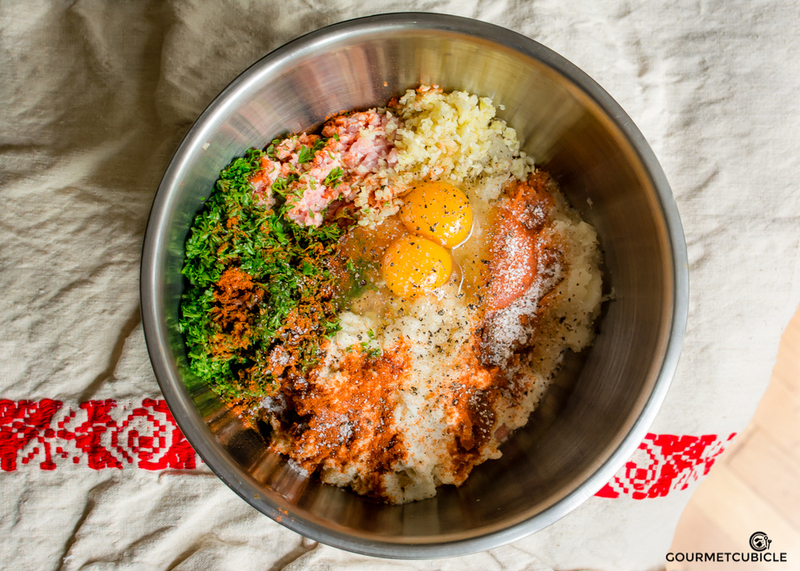 Place the ground pork in a large bowl and add the potatoes, bread, egg, crushed garlic, parsley, salt, pepper and paprika. Using your hands mix them all together. Shape the mixture into golf-sized balls and roll them in the breadcrumbs. Heat oil in a large cast iron pan over medium-high heat. Carefully place meatballs in the hot oil and fry them for 3-4 minutes on each side or until they are crispy brown. When done transfer the meatballs to a paper towel lined plate or a wire rack. Serve meatballs fresh and warm with a side of marinara sauce. The amount of oil you'll have to use will depend on the size of the frying pan you're using. Make sure that the pan has about half inch of oil. Do not overload the frying pan with meatballs as the temperature of the oil will drop too much and the meatballs will become greasy. Work in batches instead.